The letters TMJ describe the ‘Temporal Mandibular Joint’ that connects your lower jaw to your head. Some people use the letters TMD where the D stands for Dysfunction. TMJ, TMD and TMJ/D all mean the same thing. This joint is the most complex, unique and hard-working joint in the human body. It can move backward, forwards, left, right, up, down diagonally and in every conceivable direction. 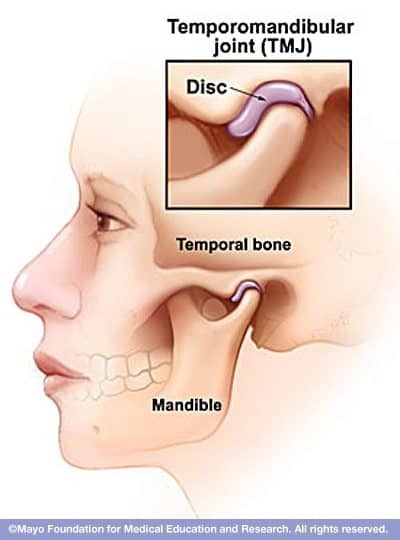 The jaw bone connects with the head bone, shock absorbers called discs, cushion and help ease the stress of the bone moving on bone. This joint can be subject to trauma, displacement of the discs, grinding, overbuilt crowns or bridges, misalignment of teeth, wear and tear, bone spurs, disc impingement and compression of disc fluid can all cause extreme pain. Symptoms of TMJ/D can vary from mild discomfort to excruciating, debilitating pain that can often be mistaken for other health issues. Everyone is at risk of developing TMJ/D issues. Sometimes the problems develop when the upper and lower jaw don’t reach their genetic potential. If a child is nutritionally deficient and breathes through their mouth the tongue doesn’t create enough outward pressure to produce the ideal jaw width, a narrow high palate can be a contributing factor to TMJ/D issues particularly as the child moves from baby teeth to adult teeth. Sometimes fillings, bridge work or crowns can cause the jaws to become misaligned and sprain the jaw joints. The current conventional treatment for TMJ/D includes, massage, physiotherapy, chiropractic, acupuncture, craniology and conventional dental therapy can involve splint therapy, surgery, orthodontics, crowns, bridges and full mouth rebuilds. Our approach is conservative and painless. We use biophotonics (also knows as low level laser therapy) to help the damaged tissue restore. We use exclusion zone water, magnesium sprays, special SOS appliances, facia release using SOS hand tool, Tscan to analyze misalignment of any or all teeth. Essentially, we see TMJ problems as you would observe a bad sprain, the scientific treatment for a bad sprain is RICE (Rest, Ice, compress, elevate) and we achieve this with a unique system called SOS that is designed for each individuals teeth and jaw joints. Nutritionally, the primary requirements are magnesium, vitamin D, and B12. We treat the jaw joints as other physical therapists treat sprained ankles. The honoured protocols are R.I.C.E meaning Rest, Immobilise, Compress, Elevate. Obviously, this is more involved with strains in the jaw joints, but we have the answers! TMJ dysfunction can involve both soft and hard tissue damage. Bone, Fascia, muscle fibres, cells and synovial fluid can be torn or broken. We heal to the cellular level. The good news is that no matter how the cells and tissue have been abused, they can come back into balance with our help.